Join Now. Select a Membership that fits your taste and lifestyle. You decide which of our two clubs – Club Select or Club Elite – best suit your taste and your budget. Do you love reds? No problem. We won’t ship you whites. Do you love both? You’re in luck! You’ll love having plenty of new wines on hand to share with family and friends. You will enjoy being the first when it comes to tasting our new wine releases as many of our exclusive wines make their debut in our Artisan Collection™ Wine Club. Treat all the amazing moms in your life to this selection of mom-approved favorites. 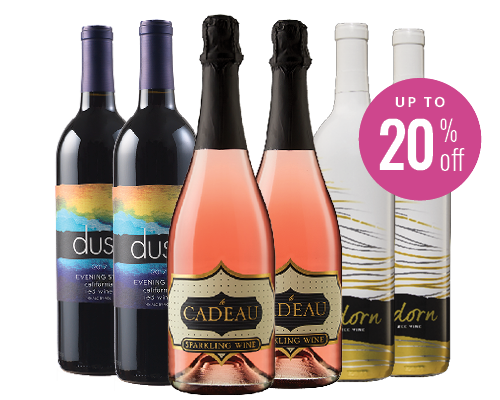 This Hot Deal features the pink & bubbly le Cadeau Rosé Sparkling Wine, perfect for Mother’s Day brunch, the dry & slightly spicy Dusk 2017 Evening Star, perfect for relaxing after a long day and the luxurious & bold Adorn 2016 Cabernet Sauvignon-Cabernet Franc, perfect for a special dinner. As a Wine Club Member, enjoy an exclusive discount of up to 20% off throughout April, while supplies last. *You must be an Artisan Collection™ Wine Club Member who has been billed for your first scheduled monthly shipment to qualify for and view this special offer. Login required. Please contact your Wine Consultant for assistance if needed. Three-bottle offer: 1 bottle of each featured wine. Half-Case offer: 2 bottles of each featured wine. Case offer: 4 bottles of each featured wine. Promotion for non-IWCs only. Offer subject to change, other terms and conditions may apply. While supplies last. Wines of a similar varietal, quality and value may be substituted for wines that have sold out. Subject to state volume limitations. As an Artisan Collection™ Select Wine Club Member, every month you will receive two incredible, limited-production wine selections, with your choice of reds, whites or a mix of both. As an Artisan Collection™ Select or Elite Pre-Paid Wine Club Member, every month you (or your gift recipient) will receive two or four incredible, limited-production wine selections, with your choice of reds, whites or a mix of both. Simply choose a 3, 6 or 12-month Membership option to get started. As an Artisan Collection™ Elite Wine Club Member, every month you will receive four incredible, limited-production wine selections, with your choice of reds, whites or a mix of both. It’s flexible, it’s fun, it’s what a great wine club should be! I love trying new and excellent wines. The best part is sharing them with good friends. I love fine wines and chilling on my couch while watching chick flicks. Who wouldn’t love having fine wine shipped to their home! I have never enjoyed wine so much as I have since joining the WineShop At Home Wine Club. Excellent wines, no regrets and the convenience of having my wines shipped to my door and on hand for family and friends to enjoy is awesome. With these selections it’s always a surprise and always a memorable tasting. Tell us why you like being a member of the Artisan Collection Wine Club. Some submissions will be selected to appear on our website. QWhat wines will I receive each month? Club Select Members receive two different wine selections each month. Club Elite Members receive four bottles, two of each different wine selection. Depending on the Membership you select –all reds, all whites, or a mixture – you will receive a selection of varietals in those categories. WineShop At Home is proud to offer exclusive, often award-winning artisan wines that are not available in stores, showcasing more unique wine styles, varietals and appellations than any other wine company. We source from premier winegrowing regions in California and throughout the world to bring you the very best wines on earth. Our wines are handcrafted by our winemaker and priced for extraordinary value. QWhat should I do if a wine is "corked" or leaking? If you receive a wine that is corked (smells musty) or wine is leaking from the cork, please contact our customer service department at 1-800WineShop or help@wineshopathome.com and we will send you a replacement wine at no additional charge. Due to shipping temperature variations or compromised corks, wine leakage can occur. Crystals or sediment in wine is naturally occurring and not an indication of quality. We encourage our customers to always sample a wine first before determining there may be a problem with the wine. QWhat states do you ship to? WineShop At Home ships to many states. Please refer to our current service areas. QWhen will I receive my wine club shipments? Wine Club shipments are typically sent via ground shipping from our Home Winery and office location in California on or before the 15th of each month. Periodically you can experience slight delays due to weather or other factors. QHow are the wines shipped? The wines are shipped via a ground carrier with an over 21 adult signature required. If you are not home to receive wine shipments, please make sure to have them sent to your office or a neighbor’s home. Our Independent Wine Consultants are not allowed to accept Wine Club shipments on behalf of customers. QWhen will I be billed for my Wine Club? New Members will be billed and shipped upon enrolling in the Wine Club. After the initial shipment, Members will then be billed the 1st business day of each month, and shipped on the 15th. For example, if you join on the 25th of the month, your first shipment will go out immediately. You will again be billed on the 1st for the next month’s shipment. QWhat if I want to change my Membership or the types of wines I receive? You may switch your Membership to any combination of wine types: all reds, all whites, or a mixture of both. Simply contact our customer service department at help@wineshopathome.com to make the request. QWhat if I need to cancel my Membership? If you need to cancel your Membership for any reason, you may do so with no obligation after the first shipment. Simply contact your Independent Wine Consultant or WineShop At Home directly at 1-800-946-3746 during our normal business hours, Monday-Friday: 7am – 6pm, Saturday: 9am – 2pm Pacific. Alternatively, send an email to help@wineshopathome.com requesting to cancel your Wine Club. If emailing, please include your reason for cancelling. QCan I re-order wines I receive in my monthly shipment? Yes, you may re-order wines, but quantities are very limited. Please contact your Independent Wine Consultant to place your orders. QHow much is tax & shipping? Shipping for the Club Select Membership is $15.00 and $20.00 for the Club Elite Membership. Tax rates may vary and my also apply to shipping rates, depending on shipping location. QWhat are the payment options? WineShop At Home bills credit cards automatically on the 1st of the month. You may also elect to have your checking account automatically debited when paying by check upon enrollment. Nowadays, there is a new trend in cellars, using eggs. No, I am not talking about the process by which we can stabilize and clarify red wines using real albumin from eggs. The oval objects I am talking about are concrete, egg-shaped tanks. They are one of the fastest growing enological products sold to American cellars. Concrete eggs are essentially a large version of clay amphorae (two-handled jars used by the ancient Greeks and Romans to carry wine or oil). Our President & CEO, Jane Creed, always guides us here at WineShop At Home to use only the truth – without buzzwords or false claims. We have high standards for our wines and our words. All 10,000 wineries in the U.S.
Over the past few months, we have been following the development of the grapevine. March is truly the beginning of the growing cycle, following the pruning. Introducing people to our artisan wines is my passion and delight! You explore the world of wine at your private tasting with up to 14 friends or clients. I get to have share great wine, meet wine lovers and earn money, sipping and swirling wine; the drink of the Gods. The best way to buy wine is to try it first, and at your tasting, I can bring the romance of the vineyard to your home, while we enjoy six artisan wines! If you are interested in hosting a tasting or becoming a wine consultant contact me today. You will discover a world of wine, waiting for you to enjoy. Cheers!